The real importance of getting out onto your public lands is that you meet them (in all their wonder and wildness) and find out how they’re doing. Meeting national public lands is our nationally shared privilege. And checking on how they’re doing is only our first step in repaying them for the life they provide us. The second step, of course, is going to bat for our public lands if they’re not doing well. At the moment, the rare alpine area on top of the La Sal Mountains above Moab, Utah is being kicked apart by exotic mountain goats. 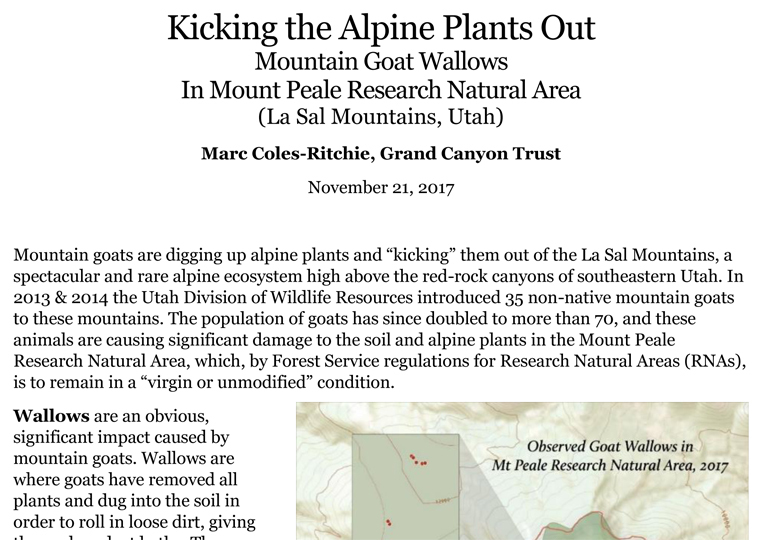 A new report by Grand Canyon Trust botanist Marc Coles-Ritchie, Kicking the Alpine Plants Out, provides georeferenced photos of 27 wallows dug into the Mount Peale Research Natural Area by the goats, and a map of where those wallows were seen. This wasn’t a systematic wallows survey, because the wallows were seen and photographed incidentally while Marc and Trust volunteers were hiking around in the research natural area to assess increases in goat damage on 45 sites first assessed in 2015. If you’ve ever hiked in an alpine area, you know it’s a world of scattered miniature plants — lichens, mosses, flowers, and bunched grasses. Exposed to sun without shade, high-speed winds, and bitter cold during their brief growing season, alpine plants manage to survive by being compact and close to the ground. And they’re slow-growing. A cushion plant three inches tall and six inches wide might be 100 years old. Thanks to a helicopter ride over the desert courtesy of the Utah Division of Natural Resources, non-native mountain goats are now kicking these plants out in order to make plant-free dust bowls for wallowing and bedding. You can see the results in Marc’s report. Unfortunately, the guardian of the Mount Peale Research Natural Area's plants, the U.S. Forest Service, is AWOL. By law, the Forest Service is required to retain its few small, scattered research natural areas, like the one on Mount Peale, in the La Sal Mountains, in a “virgin or unmodified condition.” That means the Forest Service must evict the exotic goats out of the research natural area before the native alpine vegetation is lost forever. The goats arrived by helicopter, which is also how they could leave. MICHAEL CHRISTENSEN, UTAH DIVISION OF WILDLIFE RESOURCES. 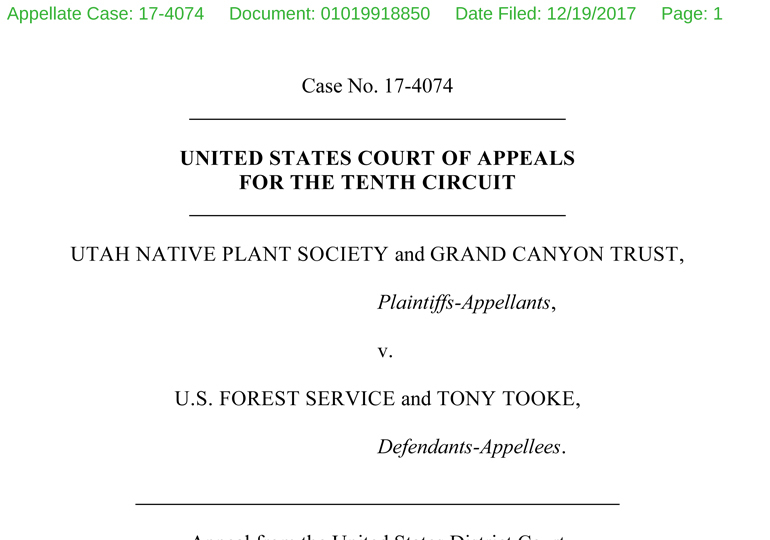 Almost two years ago, the Trust and the Utah Native Plant Society filed suit against the Forest Service for refusing to prohibit, or even regulate, the state’s goat transplants, and for refusing to remove the exotic goats already in the research natural area. 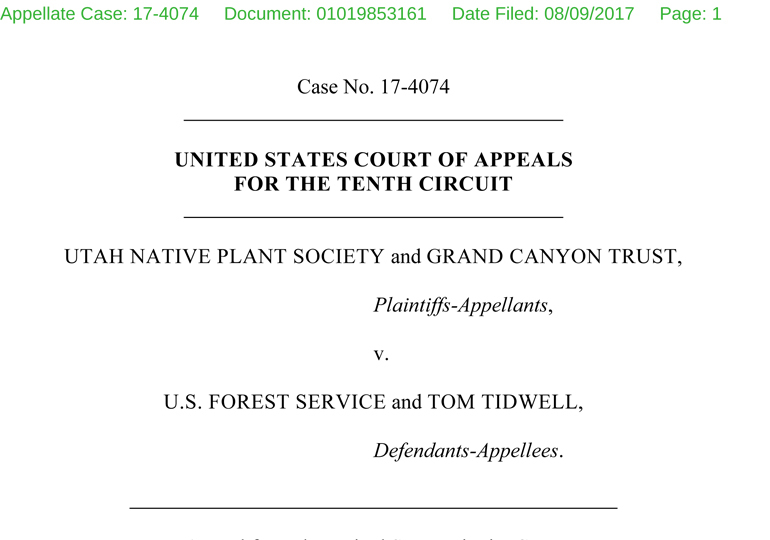 The case is currently pending before the 10th Circuit Court of Appeals. 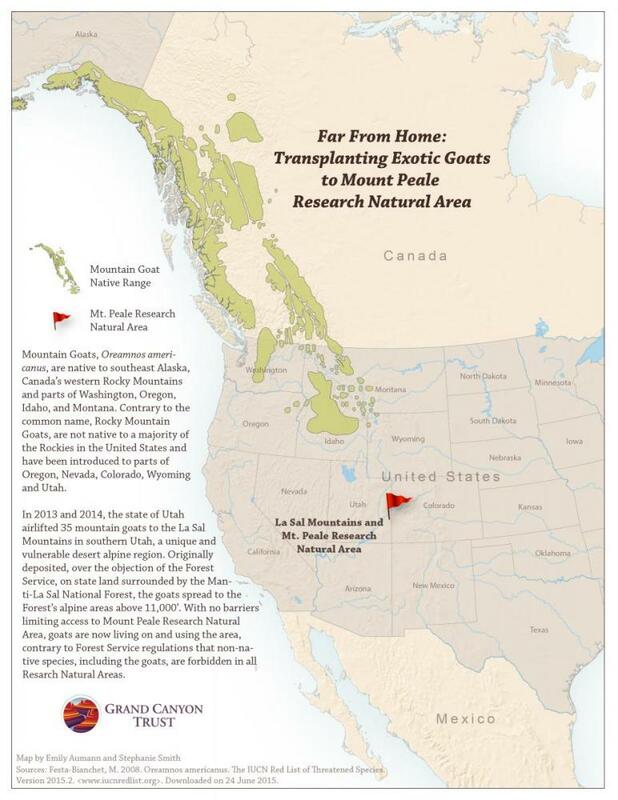 Since 2013, the mountain goat herd in the La Sal Mountains has increased to over 70, on its way to the state’s goal of a herd of 200.